July 7, 2017, 12:08 p.m.
On the heels of announcing another $24 million in funding to support 107 journalism projects across Europe in the third round of its Digital News Initiative, Google also released a report detailing the results from the first two rounds of the program. The grantees were broken down into seven different classifications covering topics such as data management and workflow, social and community, and business models. “We soon realised that there was no existing taxonomy in the news industry and in the end we decided upon a set of categories that we feel accurately distills the spirit and the activity of the projects funded to date,” the report said. Through the first two rounds of the DNI, most projects fell into the “next journalism” category, which focused on developing new tools and processes to create digital journalism. Among all the projects, the most popular focus area was multimedia, with 21 groups working on that topic. 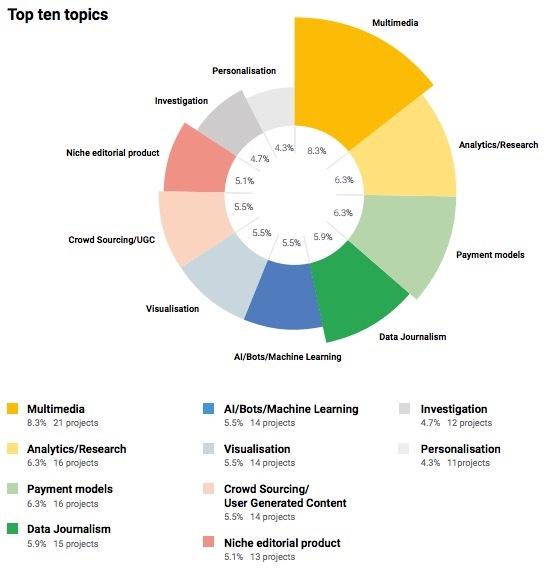 Analytics/research, payment models, and data journalism were the next most popular areas of focus. Google funded projects in 27 different countries across Europe. German outlets received the most funding, totaling €9.8 combined for the first two rounds. These two rounds of the fund were split into three tracks — prototype projects, medium projects, and large projects — and the winners were chosen based on impact, innovation, and feasibility. Most applicants and winners came from legacy media organizations, the report said. The full report, which features profiles of some of the projects and more in-depth breakdowns of the three tracks is available here as a PDF. While the third round of the DNI fund is now complete, Google also said Thursday that the fourth round, which will focus on issues of monetization, will open for applications in September. Lichterman, Joseph. 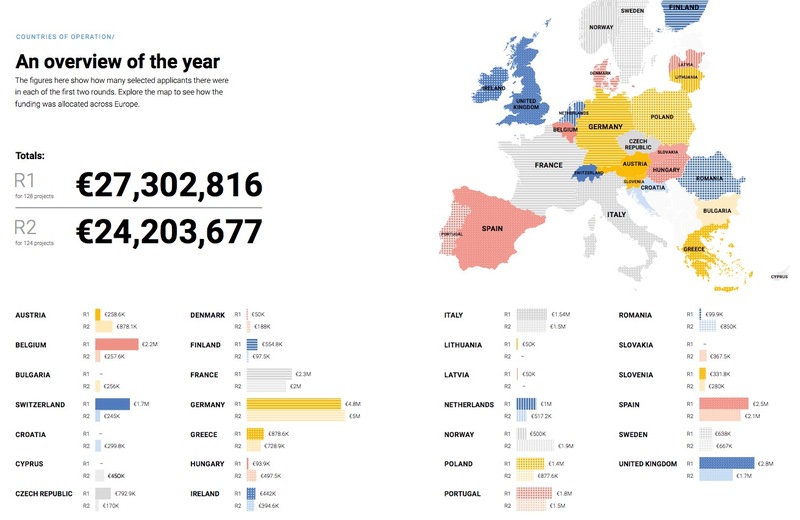 "Here are the results of the first two rounds of Google’s European Digital News Innovation Fund." Nieman Journalism Lab. Nieman Foundation for Journalism at Harvard, 7 Jul. 2017. Web. 23 Apr. 2019. Lichterman, Joseph. "Here are the results of the first two rounds of Google’s European Digital News Innovation Fund." Nieman Journalism Lab. Last modified July 7, 2017. Accessed April 23, 2019. https://www.niemanlab.org/2017/07/here-are-the-results-of-the-first-two-rounds-of-googles-european-digital-news-innovation-fund/.